Yah Veh had promised Abram a child of his own. 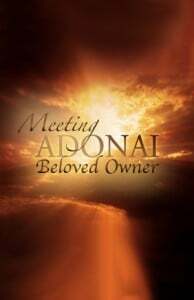 And Abram believed him, but because God was his personal Master Adonai, Abram could boldly ask for assurance. And God would reveal the most amazing visual picture-promise to the man He owned. Abram dreamed of one child. God gave multitudes. On a personal note: This little messenger is in a painful struggle to convey the staggering truth hidden in Abram’s story: the astounding result of letting God OWN you—your finances, your possessions, your hopes, your loves, your very self. I am not able to put into words my sense of wonder at our God and the intense passion with which I want you to see this. And live it! It is so real and true!